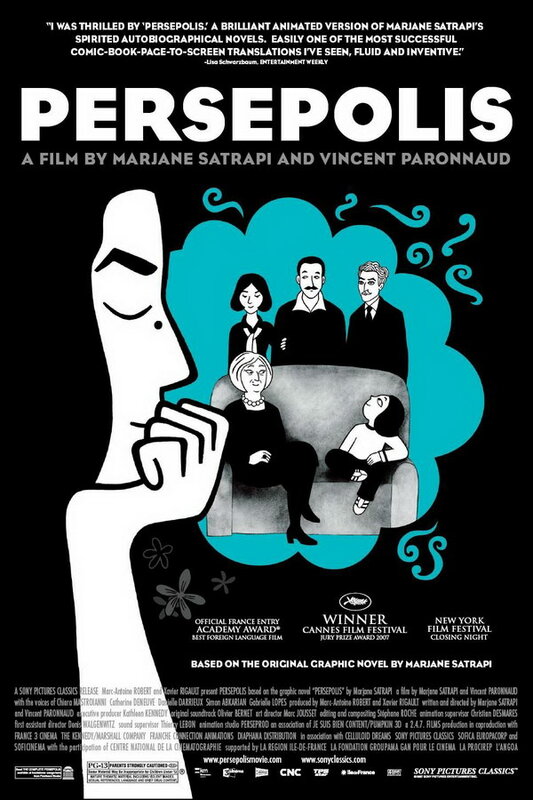 Persepolis font here refers to the font used in the poster of Persepolis, which is a 2007 French animated movie based on the autobiographical graphic novel of the same name by Marjane Satrapi. The movie title in the poster is probably set in Eagle Bold, which is a font inspired by the Blue Eagle poster in 1933. The font is a commercial one and you can read more details about it here. In addition to Persepolis, Eagle typeface is also used in the following logos, movie posters or album covers etc., including: Moonwalker (film), Inside In/Inside Out, Green Mountain Coffee, Junk of the Heart, Nivea, The Onion, The Reluctant Fundamentalist, Inditex, Planes, Paper Heart.